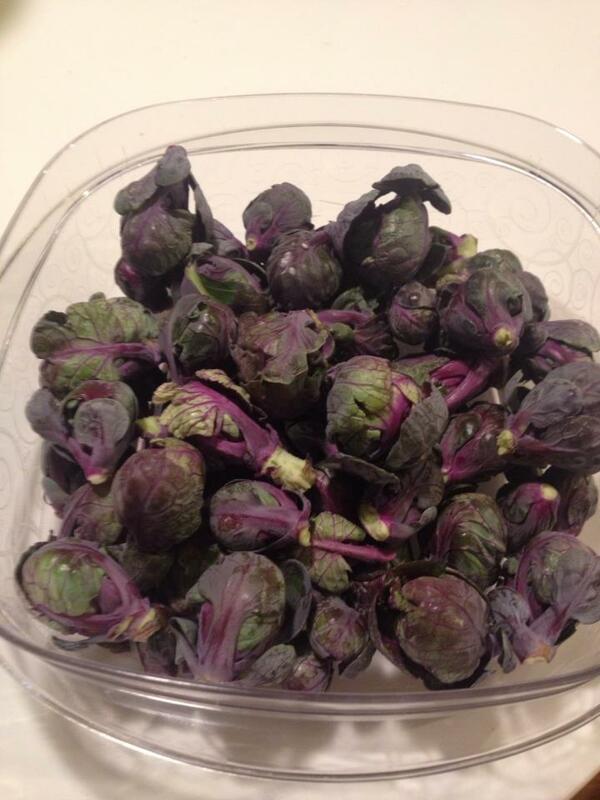 I think I mentioned that I accidentally grew purple brussels sprouts this winter. I should have been paying closer attention while plant shopping and read the plant descriptions instead of just mindlessly grabbing. But they were lovely. Purple leaves. Purple stems. 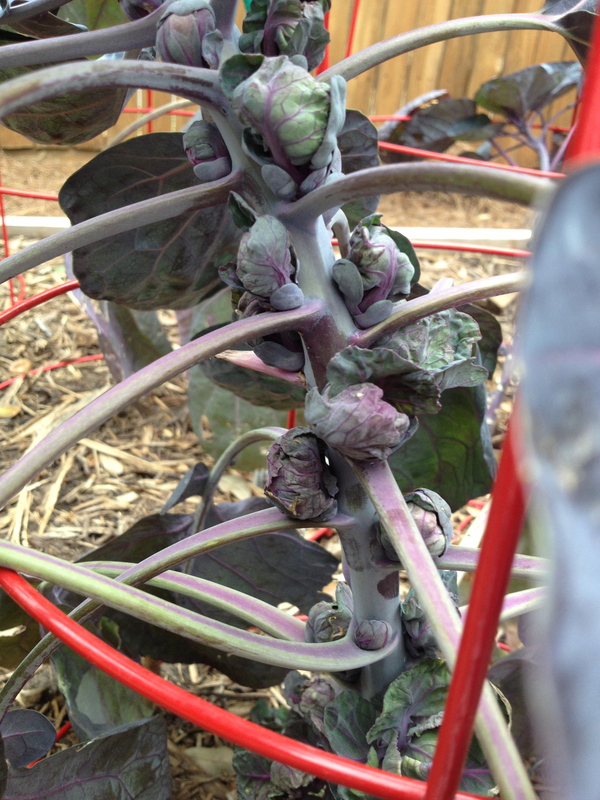 Purple-green sprouts. For those of you who are wondering why in the world I’d grow, much less eat such a vegetable, I must confess that I love brussels sprouts. For those of you saying ew, you must know that they are my absolute favorite side dish vegetable and I will have none of that. I do love avocados and artichokes more, so much that they grace the Mortroski Midcentury kitchen’s walls, in both art and avocado green paint color. 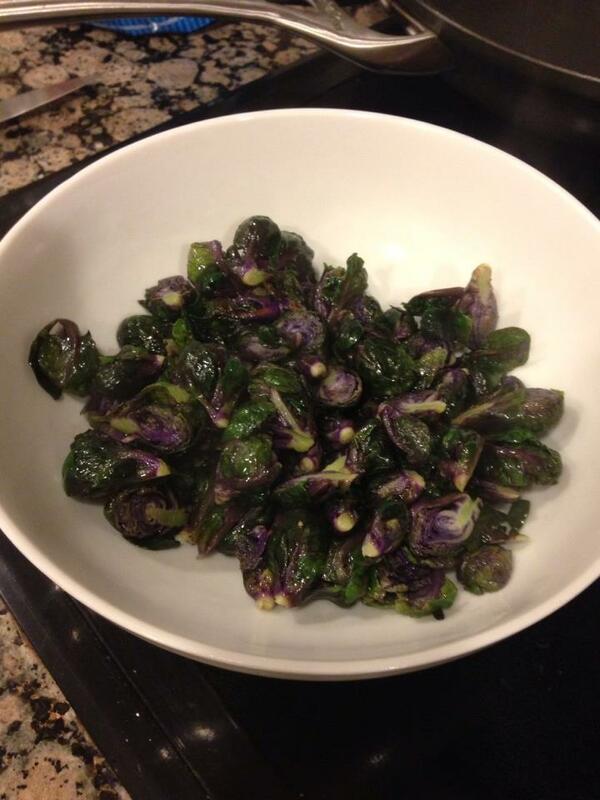 If you don’t like brussels sprouts, I’d suggest you’ve never had them fresh from the field or properly cooked. One of the best brussels sprouts dishes I have ever had was a frito mixto combined with artichokes served with a delicious aioli at the Hotel Vitale in San Francisco (it’s across from the Ferry Building where San Francisco’s best Saturday market takes place). I was there on a business trip and it was my fabulous room service dinner, eaten with a gorgeous view of the San Francisco Bay Bridge. Not only did I wish I could recreate it, I wished that I would have had someone to share it with. Bruce loves brussels sprouts too (I converted him, he did not grow up that way) and he would have been the perfect sharer, especially since he would have given me all of the artichokes. Brussels sprouts have been my go to vegetable of choice since I was a teenager. My brother hated them and would feed them to our family’s beagle under the table. Like George, Rex would eat pretty much anything so my brother could clear his plate pretty fast. In Northern California where I grew up, they are practically a native plant. They are cheap. You can buy them in winter at the farmers markets on the stalk. They last much longer in your fridge if you leave them that way. From the farmers perspective they are much easier to harvest if you just have to take a machete to a stalk versus pick every little sprout off the stem. Probably much less material to compost/dispose of too. And I bet the farmers laugh a little bit when the customers try to shove them into their market bags and baskets and wind up just throwing them over their shoulders. I know I would. 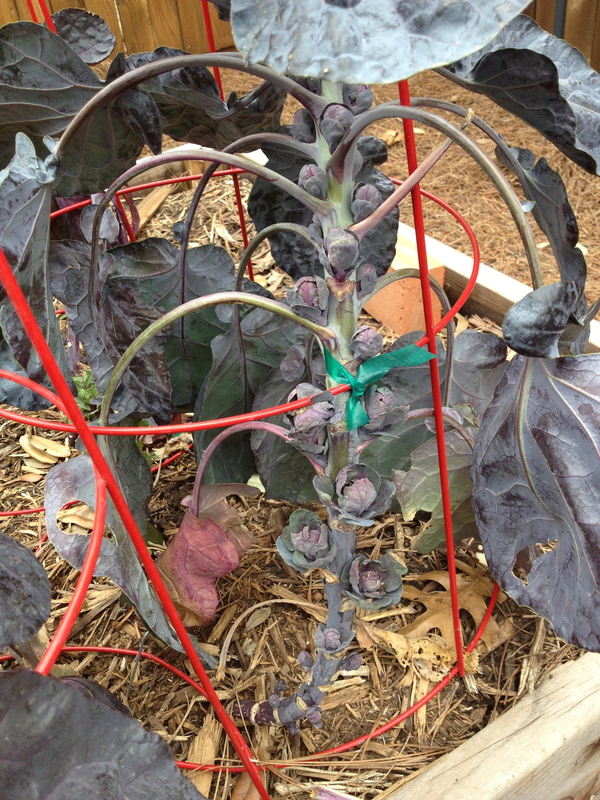 But I have to say, as pretty as they were, the purple brussels sprouts were an Urban Farm failure. Most of that was due to my greedy desire to maximize the harvest which actually ended up minimizing it. I planted 5 transplants and lost 2 over the winter. Of the 3 that were left, only 2 produced. If I try them again next fall, I will make sure that I fertilize them several times, not just upon planting. I will also make sure that I carefully chart their time to harvest so that I don’t end up with only a small bowlful to show for my efforts. But it’s spring tomorrow so it’s time to focus on the newly planted and the soon-to-be-newly planted. I’ve given myself Friday off so you can pretty much count on some planting about to happen. It’s time to get the peppers in the ground and I believe it’s safe to plant some basil too. This entry was posted in Sow and tagged 3G Network, basil, bruce, brussels sprouts, California, dogs, garden, gardening, George, Godiva, Guinness, harvest, Julie Petroski, Mortroski Midcentury, Mortroski Midcentury Urban Farm, north Texas, peppers, raised bed, sow, Texas, urban farm. Bookmark the permalink. I love brussel sprouts too. Have never seen purple ones. Do they taste any different? They are beautiful. They are beautiful but didn’t taste any different. I was hoping they were even more delicious than the regular ones, but they were the same. Glad you like them too! I am going to try your recipe. Sounds delicious. I like them roastrd, too. Love them with chopped bacon. Oh slice them in thirds if they’re big, half if small. I let them caramelize a bit. Me too. When I roast them I toss them in some garlic infused olive oil and sprinkle some parmesan on top. You can also sprinke a little but of breadcrumbs too. Sounds yummy! Will have to try that. You could add the chopped bacon when you’re ready to serve. That would be good, I bet. How can people not like a veggie that goes so well with bacon? You would like them if they were made like that. We have been on a brussel sprouts kick this winter — the little bit of bacon, pepper and olive oil is perfect! They are so tasty — had no idea about the purple ones.